Hi, my name is Susan, and I’m a …. yep. 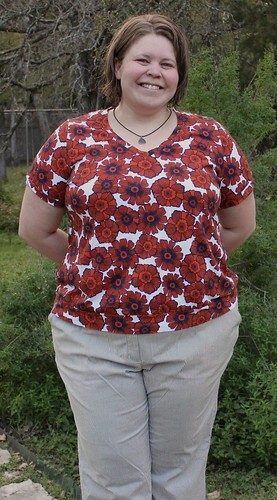 The Renfrew (from Tasia / Sewaholic Patterns) has been well covered by the blogosphere. You already know how awesome it is; you probably have 17 of your own in your wardrobe. Here are mine. So far. 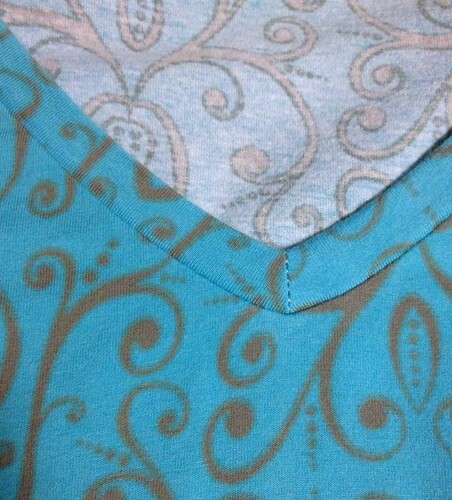 My first go at this pattern was made from this Valori Wells cotton jersey, purchased locally. It’s medium weight with 4% lycra, falling decidedly into the stable knit category that Tasia describes so well here. I like this top a lot and have worn it a few times already, but of course, after sewing it, I made fitting tweaks for future versions. I wouldn’t put any of the changes into the fault-of-the-pattern category, just the ABCs of my body. The most substantial change I made was to add a bit of length — I can’t remember exactly how much, about 1-1½”. The only area of minor struggle for me when assembling this garment was with the v-neck. This was my first time doing one, and I didn’t find the instructions exceeding helpful. But after picking it out a couple of times, I achieved success. I can’t say there was anything I figured out along the way, though — I think I just got lucky the last time. 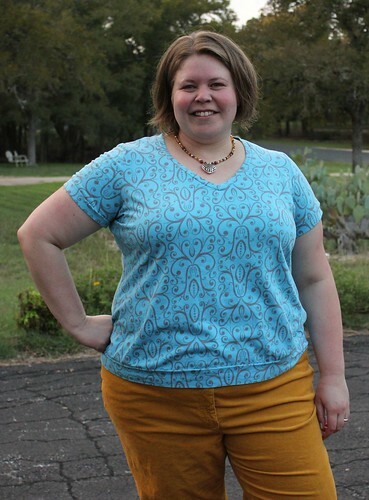 Tasia’s doing a Renfrew sewalong on her blog, and she’s posted a lot of great tips already. I’m looking forward to her explanation of this part of the process! I skipped the neckband’s topstitching this time. Just ’cause. 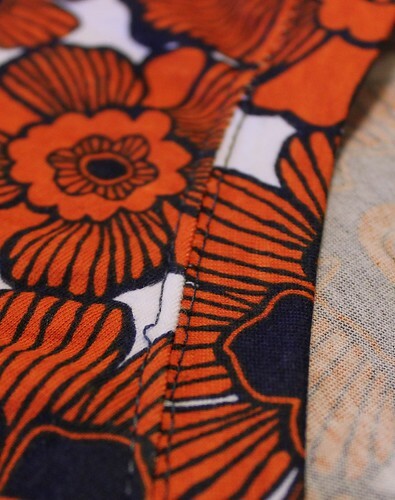 My next one was made with a medium-weight 100% cotton jersey. I’m 95% sure it was from Girl Charlee. I’m 100% sure that my stash has gotten outta control when I can’t remember where I bought my fabric. For the v-neck this time, I hand-basted the band to the shirt front at the point of the v, squeezed my eyes tight, and crossed my fingers. (The first of these helped a little; the second and third made it all more difficult than it needed to be.) It came out alright. 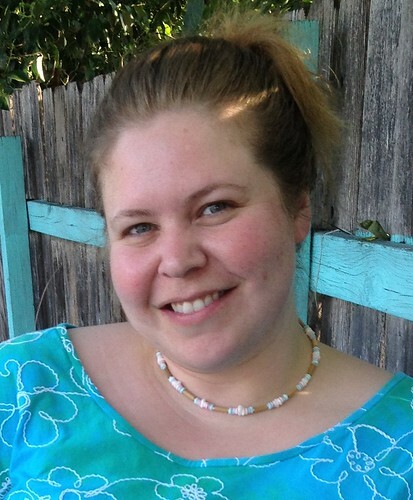 I did topstitch around the neckband this time, using a twin needle for a faux coverstitch. I have a love-hate thing going on with twin needles with my current sewing machine, so that presented some prime photo ops for beautifully imperfect stitching. This is just one of the places I didn’t unpick and redo. I’ve already cut my third ‘frew (hey, we’re tight now, I can call it that), this time with the scoop neckline. Still short sleeves. I live in Texas, yo. Cute shirt and I heart your hair! Those tops are such a neat fit on you! Love the material used too. I love your hair! That is such a cute cut on you! I love your ‘frews too, especially the blue one. Great fabric! Thanks Gail — don’t know why I waited so long (both to chop my hair off and to try the Renfrew)! Your Renfrews look *so* well constructed. I really like the neckline without the stitching. And your hair looks great! 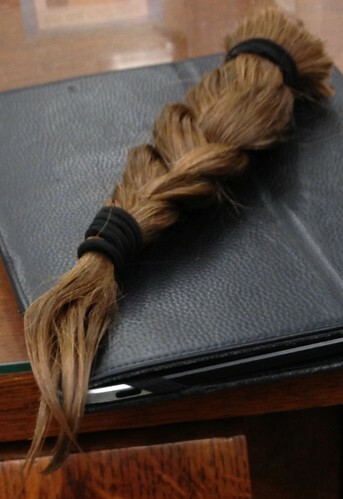 Yay to donating to Locks of Love. Thanks Mela — I like no topstitching for neckbands generally, especially knits, but sometimes they won’t behave without it! Susan, I am impressed with the perfect fit you achieved! Your Renfews are gorgeous. And, I am a new reader, so I haven’t seen older posts with longer hair – your short cut is really fresh. (so jealous of that thick braid. you have approximately 10 times more hair than I do).